When homeowners are considering the right house siding materials, there are several major manufacturers that will offer their product. The following article addresses only a few of the many options that are available to homeowners. Wood siding manufacturers focus on authentic wood finishes, which offer the true beauty of wood. Different manufacturers will carry a selection of several styles. 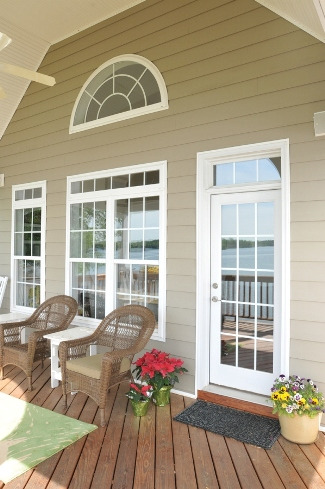 All of these styles are typically coated by the manufacturer in order to protect the wood siding. This siding can then be paired with a variety of finishes in order to produce any color that a homeowner should desire. However, wood is naturally vulnerable to pests and requires a level of upkeep and protection. It is also not ideal for environments of high moisture. Inexperienced homeowners may have trouble with the level of maintenance required for this type of siding. Most manufacturers will include a complete warranty with the wood siding. Vinyl manufacturers will advertise their popular vinyl siding and its success because of its resistance to damage and high wind rating. 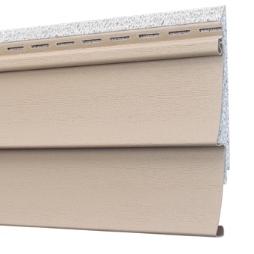 In recent times, some manufacturers have paired vinyl siding with a unique insulation system to help further dampen blows from objects and weather conditions. This foam insulation system softens the strikes from incoming objects and can be useful, but in heavy storm conditions, vinyl can easily crack. All providers will offer a wide range of colors and mention that vinyl requires very little maintenance. However, vinyl can easily warp in the heat, and it is vulnerable to cracks. Most manufacturers will include a warranty with their siding. Aluminum manufacturers focus on durability, especially because their siding is being created out of the strong metal aluminum. These products attempt to replicate the popular and desirable look of wood, but fail to provide the natural look most homeowners seek after. Most manufacturers will coat the siding with a finish for added protection and shine and with time, the paint will chalk and leave a white film over the siding. The aluminum can be painted, but homeowners should be warned that this color can fade, and the siding will eventually need to be repainted. It also needs to be inspected regularly, as it is more prone to scratches and dents, which, if not taken care of quickly, can lead to disastrous results. Manufacturers produce Everlast siding out of a combination of stone and resin. It has the look and feel of wood and durability comporable or better than alternatives. Everlast is eco-friendly, as 100% of the material used in its production is recyclable and contains no wood fibers. There are many color choices that need not be repainted, but homeowners can certainly choose to do so if they desire a color change. Everlast Composite Siding requires a very low level of maintenance; most dirt can be removed with a typical power washing. The planks are guaranteed not to bend or bow, meaning that they can withstand high temperatures and extreme weather conditions as well. All Everlast products come with a Limited Lifetime Performance warranty and a Lifetime Fade warranty (see actual warranty for details).